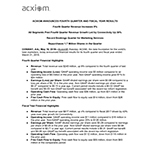 "Q4 FY18 Text and Financials"
CONWAY, Ark.--(BUSINESS WIRE)--Acxiom® (Nasdaq: ACXM), the data foundation for the world’s best marketers, today announced financial results for its fourth quarter and fiscal year ended March 31, 2018. Revenue: Total revenue was $245 million, up 9% compared to the fourth quarter of last year. Operating Income (Loss): GAAP operating income was $5 million compared to an operating loss of $9 million in the prior year. Non-GAAP operating income grew 61% to $34 million. Earnings (Loss) per Share: GAAP diluted earnings per share were $0.06 compared to a loss per share of $0.10 in the prior year. Non-GAAP diluted earnings per share were $0.27 compared to $0.15 a year ago. Current period results include a $0.02 GAAP tax benefit and $0.03 non-GAAP tax benefit associated with the recent tax reform legislation. Operating Cash Flow: Operating cash flow was $36 million, up from $31 million in the prior year. Free Cash Flow to Equity: Free cash flow to equity was $14 million, down from $26 million in the prior year. Revenue: Total revenue was $917 million, up 4% compared to fiscal 2017 driven by 43% year-over-year growth for Connectivity. Operating Income: GAAP operating income was $11 million compared to $16 million in the prior year. Non-GAAP operating income grew 25% to $126 million. Earnings per Share: GAAP diluted earnings per share were $0.29 compared to earnings per share of $0.05 in the prior year. Non-GAAP diluted earnings per share were $0.94 compared to $0.71 a year ago. Current period results include a $0.31 GAAP tax benefit and $0.08 non-GAAP tax benefit associated with the recent tax reform legislation. Operating Cash Flow: Operating cash flow was $112 million, down from $116 million in the prior year. Free Cash Flow to Equity: Free cash flow to equity was $55 million, down from $63 million in the comparable period. *Excluding the divesture of Acxiom Impact, Marketing Services FY18 revenue was down 3% year-over-year. A detailed discussion of our non-GAAP financial measures and a reconciliation between GAAP and non-GAAP results is provided in the schedules attached to this press release. Beginning April 1, 2018, the Company will report its results in two business segments: LiveRamp and Acxiom Marketing Solutions. LiveRamp added approximately 30 new direct clients during the quarter and added several new partner integrations. Marketers can now onboard and activate their data across a growing network of 575 publishers and marketing technology providers. LiveRamp acquired Pacific Data Partners to accelerate its ability to power people-based business-to-business (B2B) marketing. Pieter De Temmerman and Grant Ries, co-founders of Pacific Data Partners and former Oracle and BlueKai veterans, will lead LiveRamp’s efforts to expand IdentityLink to the world’s largest B2B marketers. LiveRamp launched IdentityLink for Television to transform the world’s largest marketing medium. For the first time, brands, agencies, programmers and technology platforms will be able to execute people-based TV media planning, buying and measurement that is scalable and secure across the TV ecosystem. Marketing Services posted its largest new bookings quarter in the last five years, driven by new logo wins with Toyota, Santander Bank and American Life. Acxiom was granted six U.S. patents in fiscal 2018, representing the most patents granted in a single year in the Company’s history. Acxiom repurchased 1.7 million shares for approximately $49 million during the fourth quarter. Since March 31, 2018, the Company repurchased an additional 1.9 million shares for approximately $46 million. Since the inception of its share repurchase program in August 2011, Acxiom has repurchased a total of 21.9 million shares for $420 million, with $80 million remaining under the current authorization. Acxiom’s non-GAAP guidance excludes the impact of non-cash stock compensation, purchased intangible asset amortization, restructuring charges and strategic evaluation support costs. Total revenue of between $935 million and $955 million. GAAP loss per share of between $0.23 and $0.18. Non-GAAP diluted earnings per share of between $0.90 and $0.95. Acxiom will hold a conference call at 4:00 p.m. CT today to further discuss this information. Interested parties are invited to listen to the call which will be broadcast via the Internet and can be found on our investor site. A slide presentation will be referenced during the call and can be accessed here. This release and today’s conference call contain forward-looking statements including, without limitation, statements regarding expected levels of revenue and earnings per share. Such forward-looking statements are subject to certain risks and uncertainties that could cause actual results to differ materially. The following are factors, among others, that could cause actual results to differ materially from these forward-looking statements: the possibility that the expected revenue from the divisions may not be realized within the expected timeframe; the possibility that our exploration of potential strategic alternatives for Acxiom Marketing Solutions does not have a successful outcome; the possibility that the integration of acquired businesses may not be successful as planned; the possibility that certain contracts may not generate the anticipated revenue or profitability or may not be closed within the anticipated time frames; the possibility that significant customers may experience extreme, severe economic difficulty or otherwise reduce or cancel the amount of business they do with us; the possibility that we will not successfully complete customer contract requirements on time or meet the service levels specified in the contracts, which may result in contract penalties or lost revenue; the possibility that data purchasers will reduce their reliance on us by developing and using their own, or alternative, sources of data generally or with respect to certain data elements or categories; the possibility that data suppliers might withdraw data from us, leading to our inability to provide certain products and services to our clients; the possibility that we may not be able to attract, retain or motivate qualified technical, sales and leadership associates, or that we may lose key associates; the possibility that we may not be able to adequately adapt to rapidly changing computing environments, technologies and marketing practices; the possibility that we will not be able to continue to receive credit upon satisfactory terms and conditions; the possibility that negative changes in economic conditions in general or other conditions might lead to a reduction in demand for our products and services; the possibility that there will be changes in consumer or business information industries and markets that negatively impact the company; the possibility that the historical seasonality of our business may change; the possibility that we will not be able to achieve anticipated cost reductions and avoid unanticipated costs; the possibility that the fair value of certain of our assets may not be equal to the carrying value of those assets now or in future time periods; the possibility that unusual charges may be incurred; the possibility that changes in accounting pronouncements may occur and may impact these forward-looking statements; the possibility that we may encounter difficulties when entering new markets or industries; the possibility that we could experience loss of data center capacity or interruption of telecommunication links; the possibility the European General Data Protection Regulation, which becomes effective May 25, 2018, will make it more difficult and/or costly for us to do business in the EU; the possibility that new laws may be enacted which limit our ability to provide services to our clients and/or which limit the use of data; and the possibility that other risks and uncertainties may emerge, including those detailed from time to time in our current and periodic reports filed with the Securities and Exchange Commission, including our current reports on Form 8-K, quarterly reports on Form 10-Q and annual reports on Form 10-K, particularly the discussion under the caption “Item 1A. RISK FACTORS” in our Annual Report on Form 10-K for the year ended March 31, 2017, which was filed with the Securities and Exchange Commission on May 26, 2017. With respect to the provision of products or services outside our primary base of operations in the United States, all of the above factors apply, along with the difficulty of doing business in numerous sovereign jurisdictions due to differences in scale, competition, culture, laws and regulations. Acxiom, LiveRamp, IdentityLink, InfoBase and all other Acxiom marks contained herein are trademarks or service marks of Acxiom Corporation. All other marks are the property of their respective owners. (1) This presentation includes non-GAAP measures. Our non-GAAP measures are not meant to be considered in isolation or as a substitute for comparable GAAP measures, and should be read only in conjunction with our condensed consolidated financial statements prepared in accordance with GAAP. For a detailed explanation of the adjustments made to comparable GAAP measures, the reasons why management uses these measures and the material limitations on the usefulness of these measures, please see Appendix A. (2) Income taxes were calculated using an effective non-GAAP tax rate of 31.6% and 37.0% in the fourth quarter of fiscal 2018 and 2017, respectively, and 34.3% and 39.2% for the twelve months ended March 31, 2018 and 2017, respectively. The difference between our GAAP and non-GAAP tax rates were primarily due to the Tax Cuts and Jobs Act and net tax effects of the excluded items. Some totals may not add due to rounding. (1) This presentation includes non-GAAP measures. Our non-GAAP measures are not meant to be considered in isolation or as a substitute for comparable GAAP measures, and should be read only in conjunction with our condensed consolidated financial statements prepared in accordance with GAAP. For a detailed explanation of the adjustments made to comparable GAAP measures, the reasons why management uses these measures, the usefulness of these measures and the material limitations on the usefulness of these measures, please see Appendix A. Some earnings (loss) per share amounts may not add due to rounding. (2) Income taxes were calculated using an effective non-GAAP tax rate of approximately 28.0%. The difference between our GAAP and Non-GAAP tax rates was due to the effect of excluded items. To supplement our financial results, we use non-GAAP measures which exclude certain acquisition related expenses, non-cash stock compensation and restructuring charges. We believe these measures are helpful in understanding our past performance and our future results. Our non-GAAP financial measures and schedules are not meant to be considered in isolation or as a substitute for comparable GAAP measures and should be read only in conjunction with our consolidated GAAP financial statements. Our management regularly uses these non-GAAP financial measures internally to understand, manage and evaluate our business and to make operating decisions. These measures are among the primary factors management uses in planning for and forecasting future periods. Compensation of our executives is also based in part on the performance of our business based on these non-GAAP measures. Purchased intangible asset amortization: We incur amortization of purchased intangibles in connection with our acquisitions. Purchased intangibles include (i) developed technology, (ii) customer and publisher relationships, and (iii) trade names. We expect to amortize for accounting purposes the fair value of the purchased intangibles based on the pattern in which the economic benefits of the intangible assets will be consumed as revenue is generated. Although the intangible assets generate revenue for us, we exclude this item because this expense is non-cash in nature and because we believe the non-GAAP financial measures excluding this item provide meaningful supplemental information regarding our operational performance. Non-cash stock compensation: Non-cash stock compensation consists of charges for associate restricted stock units, performance shares and stock options in accordance with current GAAP related to stock-based compensation including expense associated with stock-based compensation related to unvested options assumed in connection with our acquisitions. As we apply stock-based compensation standards, we believe that it is useful to investors to understand the impact of the application of these standards to our operational performance. Although stock-based compensation expense is calculated in accordance with current GAAP and constitutes an ongoing and recurring expense, such expense is excluded from non-GAAP results because it is not an expense that typically requires or will require cash settlement by us and because such expense is not used by us to assess the core profitability of our business operations. Restructuring charges: During the past several years, we have initiated certain restructuring activities in order to align our costs in connection with both our operating plans and our business strategies based on then-current economic conditions. As a result, we recognized costs related to termination benefits for associates whose positions were eliminated, lease termination charges, and leasehold improvement write offs. These items, reported as gains, losses, and other items, net, are excluded from non-GAAP results because such amounts are not used by us to assess the core profitability of our business operations. Separation and transformation costs: In previous years, we incurred significant expenses in connection with the separation of our IT Infrastructure Management (“ITO”) and the subsequent transformation of our remaining operating segments. This work enabled us to transform our external reporting and provide investors with enhanced transparency and more granular segment-level disclosures in addition to facilitating the ITO disposition. In the prior and current year, we are incurring expenses to further separate the financial statements of our three operating segments, with particular focus on segment-level balance sheets, and to evaluate portfolio priorities. Our criteria for excluding separation and transformation expenses from our non-GAAP measures is as follows: 1) projects are discrete in nature; 2) excluded expenses consist only of third-party consulting fees that we would not incur otherwise; and 3) we do not exclude employee related expenses or other costs associated with the ongoing operations of our business. We substantially completed these projects during the third quarter of fiscal year 2018. Beginning in the fourth quarter of fiscal 2018, we incurred transaction analysis and support expenses related to the Company’s announced evaluation of strategic options for its Marketing Solutions business. Our criteria for excluding these transaction related costs are the same. We believe excluding these items from our non-GAAP financial measures is useful for investors and provides meaningful supplemental information. Non-GAAP EPS and Non-GAAP Income from Operations: Our non-GAAP earnings per share and Non-GAAP income from operations reflect adjustments as described above, as well as the related tax effects where applicable. Adjusted EBITDA: Adjusted EBITDA is defined as net income from continuing operations before income taxes, other expenses, depreciation and amortization, and including adjustments as described above. We use Adjusted EBITDA to measure our performance from period to period both at the consolidated level as well as within our operating segments and to compare our results to those of our competitors. We believe that the inclusion of Adjusted EBITDA provides useful supplementary information to and facilitates analysis by investors in evaluating the Company’s performance and trends. The presentation of Adjusted EBITDA is not meant to be considered in isolation or as an alternative to net earnings as an indicator of our performance. Free Cash Flow to Equity: To supplement our statement of cash flows, we use a non-GAAP measure of cash flow to analyze cash flows generated from operations. Free cash flow to equity is defined as operating cash flow less cash used by investing activities (excluding the impact of cash paid in acquisitions), less required payments of debt, and excluding the impact of discontinued operations. Management believes that this measure of cash flow is meaningful since it represents the amount of money available from continuing operations for the Company’s discretionary spending after funding all required obligations including scheduled debt payments. The presentation of non-GAAP free cash flow to equity is not meant to be considered in isolation or as an alternative to cash flows from operating activities as a measure of liquidity.